Controlling the atmosphere is important for frozen foods, and our architects are well-versed in designing thermal breaks, proper insulation and dehumidification. In some cases it has been advantageous for our clients to process their product in a frozen environment. 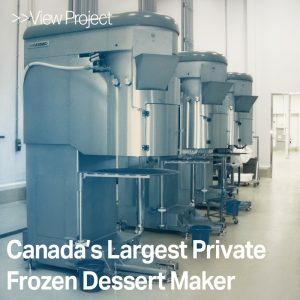 In fact, the Dreyer’s facility that Dennis Group designed and built was honored with a Food Plant of the Year recognition from Food Engineering magazine. 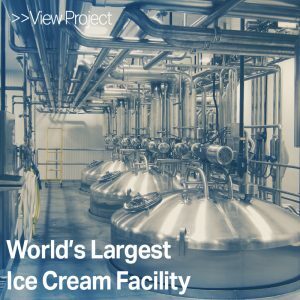 Following the success of that project, we constructed the world’s largest ice cream plant for Dreyer’s and Nestlé. We understand that the movement towards better-for-you options coupled with the entrance of competition from meal delivery services means that frozen foods today need to offer innovative ingredients, optimal flavor and texture, and nutritional benefits – all in convenient, user-friendly packaging. Our extensive background in this category make Dennis Group the right partner to help achieve these goals.